Wonderful rustic rammed earth house featuring stunning open plan kitchen/living & dining with timber lined cathedral ceilings providing a sense of spaciousness. The modern kitchen features new stainless steel oven and breakfast bar. The master bedroom has ensuite whilst the two minor bedrooms share the main bathroom. All bedrooms have BIR's. The timber decked outdoor entertaining area has direct access to the home and is surrounded by low maintenance native gardens. The house is situated in a quiet cul-de-sac with tree lined walkways leading to the town & beach. 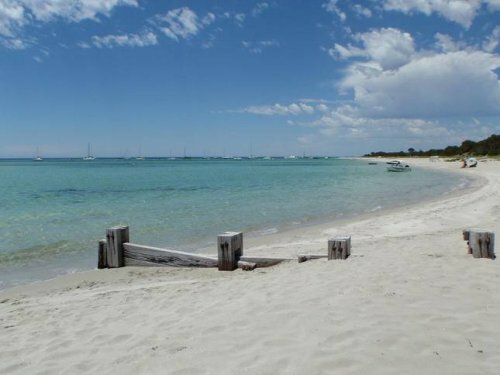 Dunsborough is situated within the sheltered shores of Geographe Bay. Voted one of the top 10 places to visit in the world by Lonely Planet, the region is famed for its breathtaking natural beauty, its world renowned vineyards and secluded calm bays. Dunsborough township offers a variety of restaurants, cafes, fashion boutiques and galleries. Other activities in the surrounding area include a world class golf course, excellent surfing breaks, an extensive network of cycle ways and walk paths. The warm weather and clear, calm seas mean Geographe Bay is widely regarded as one of the best places in Australia for whale watching. We are a retired couple originally from the UK.